Howdy. Welcome. A close, dear, and sweet friend of mine is celebrating her birthday this week. And a celebration isn't complete without a card! 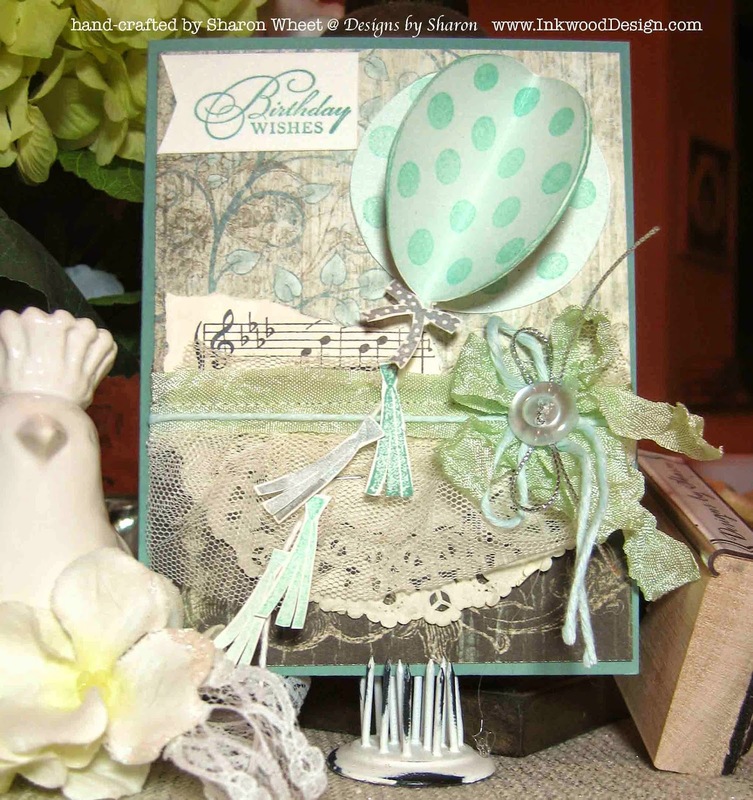 Recipe: This sweet card was hand-crafted with various paper crafting supplies. I started with solid card stock by Paper Trey Ink, in Ocean Tides color. The pattern paper is actually both sides of the same page. It is from the Birds and Blooms pattern paper collection by HeartFelt Creations. I added a tea dyed paper doily, a strip of ruffled cream tulle. I added a strip of spring green seam binding and sewn the stack together. I added a multi-loop bow made with the same seam binding. I added a bow tied with pale blue twine. I tied a vintage button to the center of this bow collection with a thin silver cord. I added a torn strip of music paper to the other side of the bow collection. I stamped the balloon three times and adhered the pieces together, to give the balloon dimension. I added a strip of white bakers twine to the balloon. I stamped and fussy cut four tassels and adhered them to the balloon string. I stamped the bow in silver ink and fussy cut it out, also. I stamped the sentiment in Juniper classic ink, by CTMH, onto shimmer white card stock and cut a flag end.